…….and how does it become dazzling wearable art? Today’s dichroic glass coating originated in the aerospace industry in the production of satellite mirrors. It is now used for lighting, fiber optics, infrared lasers, motion picture equipment, sunglasses, etc….. and ARTWORK! Dichroic glass is formed when a multi-layer coating is placed on glass through a highly technical process in a chemical lab. Quartz crystals and metal oxides are vaporized with an electron beam gun in an airless vacuum chamber where the vapor attaches and condenses on the glass surface to form a crystal structure. Different metal oxides determine the color, while various production methods determine the coating variances. The result is glass that transmits one color when looking through it, and another reflected when the glass is held at an angle. Di-chroic, meaning two-color. I take these pieces of glass formed in the highly controlled environments of the the manufacturers’ facilities into the moderately controlled (by design) environment of my studio. 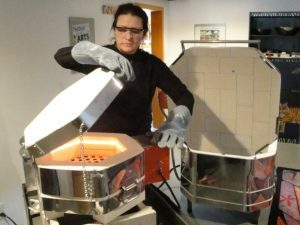 I decide upon the design, cut each piece of glass, position & layer them, insert a little moxie and fuse the pieces together in my glass kiln at temperatures up to 1500 degrees. Through the entire process of making my pieces there is also grinding, sawing, chemical etching and refiring involved. 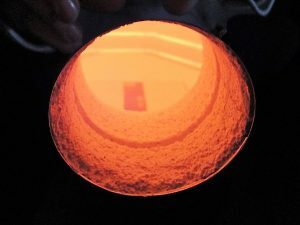 In my final step, I carefully anneal each piece, holding it at a specific temperature for a specific time, to alleviate the stress within the glass and give it added durability. Although great care has been taken through this process, it is important to remember to handle with care — it is still glass! Each piece is completed with the addition of quality findings. To sum it all up, I’m crazy about dichroic glass which I hope shows in my work. 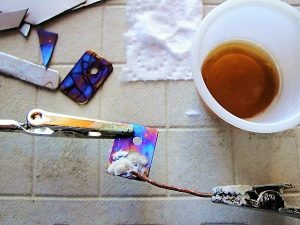 I have over 200 different dichroic glasses, taking into consideration surface coating colors, coating techniques, base colors & numerous textures. I’ve come to believe that where this fantastic glass is concerned, more is more & less is, well……….. just less! 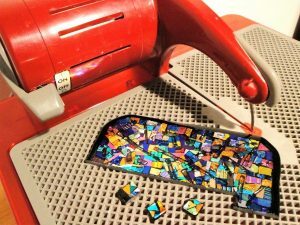 From an artist’s standpoint, each piece I create has a life of its own defined by the colors, cut, shape, textures and combinations of glass incorporated. These variables make each piece of wearable art definitely as ‘one of a kind’ as the individual who wears it! Enjoy! 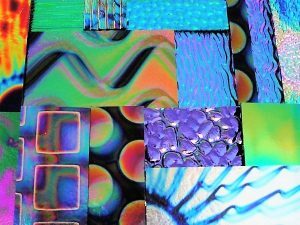 It all starts with dichroic glass of various colors, textures & patterns.